I have the vague feeling we happened by the Junaluska Memorial before May 25, 2009 when all of the pictures on this page were taken. My sense is that it was drizzling that day, so I did not take any photos of it then. But, I cannot recollect when, beyond this visit, we would have been in the area. This time we came to Robbinsville in a roundabout way when I suggested we intentionally visit the Fontana Dam area where the movie Nell was filmed. It is one of our favorite movies and the scenery is exceptional, which is why I wanted to see it firsthand. In fact, some of the "in town" shots in the film were done in Robbinsville. 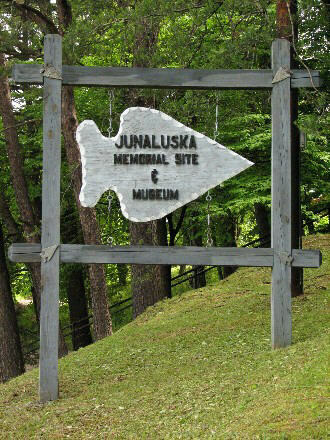 However, that is neither here nor there since this page is about Junaluska, his memorial and the museum (memorial area actually, because the museum was closed that day). One of the things I found interesting about the signage here was that they did not seem to agree about how long a life Junaluska lived, or when he died. 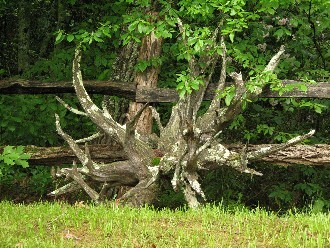 The one by the grave said he died in 1868 at over one hundred years old. It was erected in 1910 (according to the Internet). The lower walkway entrance appears to show his death in 1858, and his birth in 1776 (with a question mark) which would have made him somewhere in the vicinity of 82. 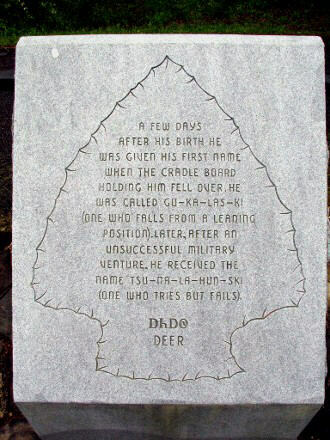 One of the arrowhead markers around the grave with information about him (which also show the names of the Cherokee clans) indicates his life was circa 1779 to 1855. That would have put him at approximately 76 years old when he died. Here are the remaining six (there are seven Cherokee clans) arrowhead stones surrounding the grave. The clan name is shown in the Cherokee Syllabary on each stone along with the English translation of the name. 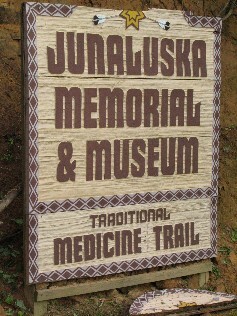 "In Robbinsville, the Junaluska Museum and Gravesite serve as the center for Cherokee Heritage Trails. 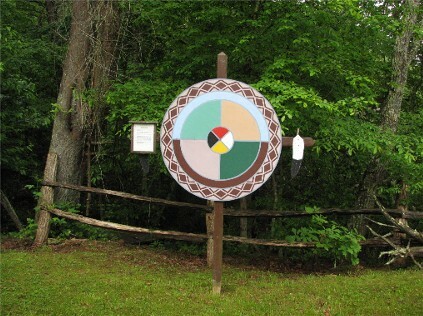 At this small, remarkable museum created by members of the Snowbird community of Cherokees from the Eastern Band, you will find information on sites and events in this area. 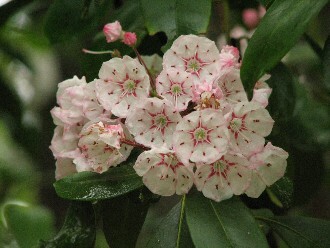 The Junaluska Memorial and Museum also present information on the Cherokee leader Junaluska, a walking trail with medicine plants, exhibits of artifacts from this area more than 6,000 years old, and the story of the Trail of Tears in this area. 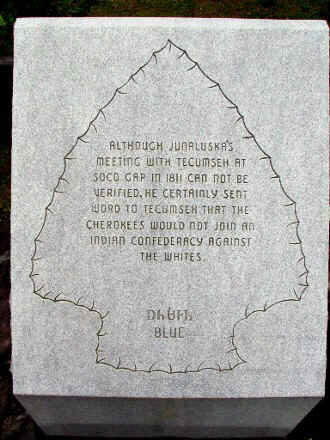 The Junaluska Memorial and Museum honor this Cherokee leader who was held in high esteem by both Cherokees and whites. 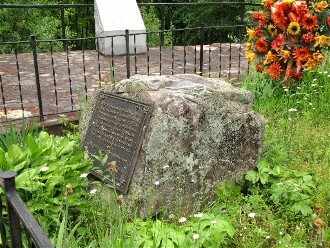 Seven large granite markers erected around his grave tell the story of his life, 1776-1858, which was shaped by the events of the turbulent period leading up to and following Removal. 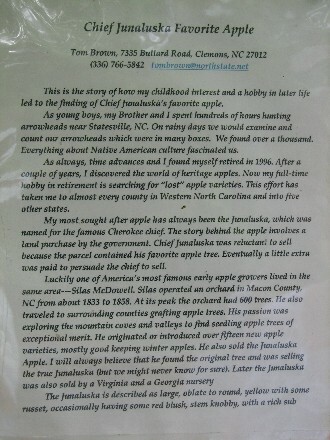 The Junaluska Museum, located just downhill, provides further information about his life. There, exhibits of artifacts from the Cheoah Valley date back more than 6,000 years, and information on the Trail of Tears is presented. Community members like Iva Rattler and Jim Bowman who helped to create the museum and who often volunteer here provide additional information on Junaluska and the Snowbird Cherokees. 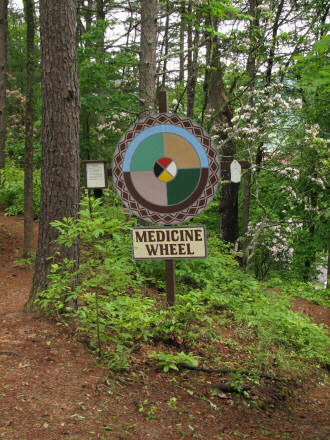 Baskets, beadwork, silversmithing, and other crafts made by Cherokee people are sold here. 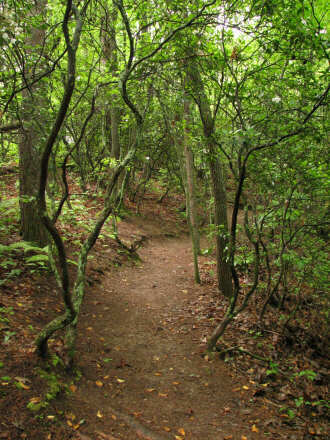 Recently, the museum created a 'Medicine Plants' walking trail that loops around the hill below the grave site, and the Friends of Junaluska are planning to expand their programming. 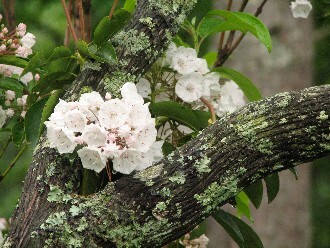 Born in 1776 in the village of Echoe, near present-day Dillard, Georgia, Junaluska and his family kept moving as the borders of the Cherokee territory kept shrinking - first to land on the Cullasaja River and then near the Valley Towns. In 1811, Cherokee oral tradition records that he met with Tecumseh at Soco Gap and declined, for the Cherokees, Tecumseh's offer to join him and all other tribes in uniting to defeat the whites." As I mentioned, we did not get to see the museum since it was closed the day we were there. 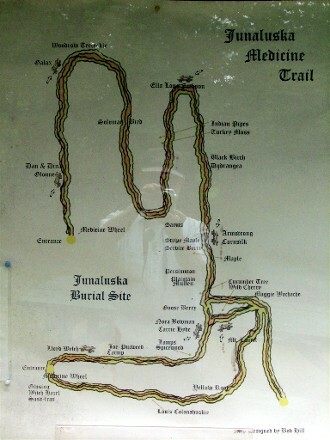 We did however spend a fair amount of time on both the upper and lower loops of the Medicine Trail. 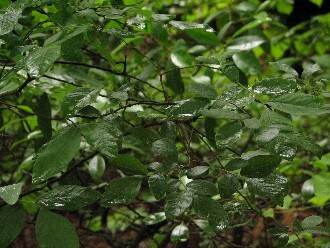 Many plants and trees were identified along with information about uses. 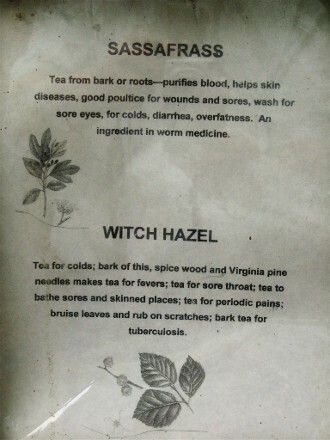 I took pictures of the signs, information sheets, and the plants for those growing in season. I am not going to combine them here. 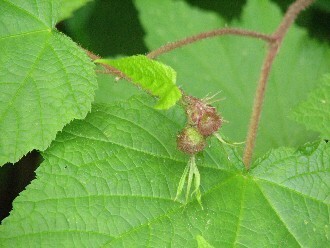 There is plenty of plant information available on the Internet. 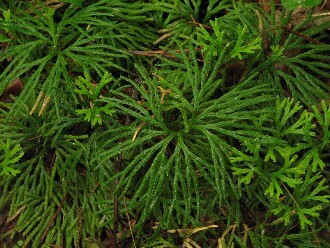 I will show cropped images of the signs just to give you an idea of the many plants identified, and I will display a couple of photos of the information sheets to show you what I am talking about. The remaining photos will simply be ones I liked from our walk on the trails and around the grounds, with some Internet text interspersed between them. Then I will wrap things up with several information signs, including a self-portrait reflection. 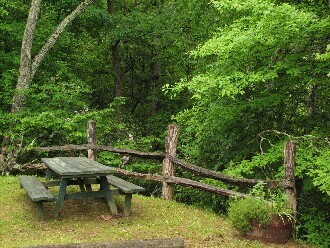 It is a pleasant place to visit. "Junaluska's contemporaries described him as tall and dignified, and say that he was a good speaker. His name comes from the Cherokee language tsunalahvski - 'He tried and failed,' because he boasted that he would go and kill all the Creeks, and when he returned, having obviously failed, this was the name he took. 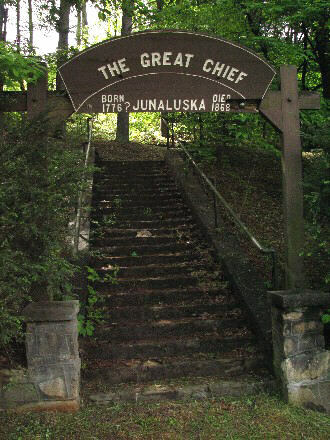 A courageous warrior and natural leader, Junaluska had three wives, having been widowed twice, and his descendants still live among the Eastern Band today. The remarks of Reverend Armstrong Cornsilk were delivered in Cherokee language and translated into English by Lewis Smith. 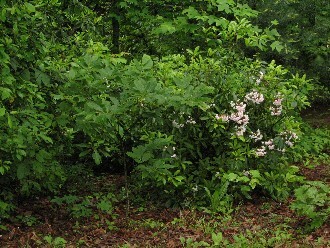 They were taken down by one of those present: 'Ladies and gentlemen, friends: We have met here at Junaluska's grave. We have met as friends and brothers and sisters. We are refreshing our memories over Juno's burial. We appreciate his going to war, and gaining the big victory for Jackson. 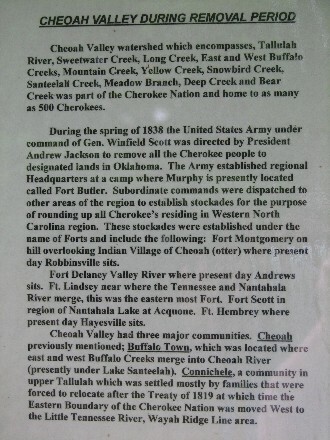 The Cherokees and whites were fighting the Creeks at that time. 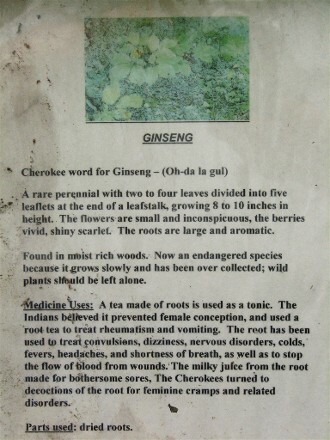 And we Cherokees feel that it was through him we have the privilege of being here today. I knew Juno at that time. I knew him well. I recollect how he looked. He wore the hair cut off the back of his head, and he would plait the hair on top of his head so as to make it stick up like horns. He was a good man. He was a good friend. He was a good friend in his home and everywhere. He would ask the hungry man to eat. He would ask the cold one to warm by his fire. He would ask the tired one to rest, and he would give a good place to sleep. Juno's home was a good home for others. He was a smart man. He made his mind think good. He was very brave. He was not afraid. Juno at this time has been dead about fifty years. I am glad he is up above [pointing upward]. I am glad we have this beautiful monument. It shows Junaluska did good, and it shows we all appreciate him together - having a pleasant time together. 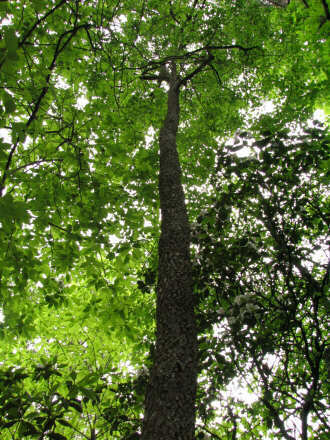 I hope we shall all meet Junaluska in heaven [pointing upward] and all be happy there together.'" "The Indian warrior who saved Andrew Jackson's life and made him a national hero lived to regret it. 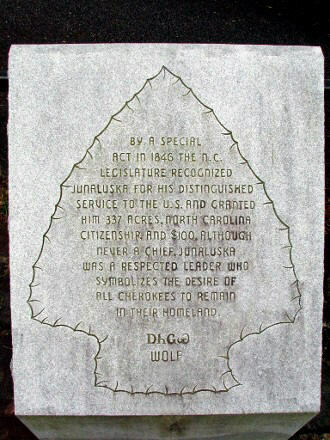 His name was Junaluska, a Cherokee chief born near what is now Dillard, Georgia around 1776. He is the unsung hero of the greatest Indian battle in history. He made his name and his fame among his own people in the War of 1812 when the mighty tribe of Creek Indians allied themselves with the British against the United States. With the opening of the Creek War, following the massacre at Fort Mims in Alabama, Junaluska recruited some 800 Cherokee warriors to go to the aid of Andrew Jackson and his Tennessee militia in an advance down the Coosa River against the Creek Red Sticks. During the waning months of 1813 Jackson's force in northern Alabama had been so reduced by mutinies and expiration of service terms that Jackson was forced to rely more and more upon the Cherokees. Jackson even employed them to garrison Fort Armstrong, on the upper Coosa, and protect his provision depot. But with the coming of the new year, he received reinforcements from Tennessee, including more Cherokee, and was able to leave his camp on the Coosa and advance on the Creek towns on the Tallapoosa. Relegating the Cherokee to duties in the rear, Jackson and his Tennessee militia moved like a scythe through the Creek towns. 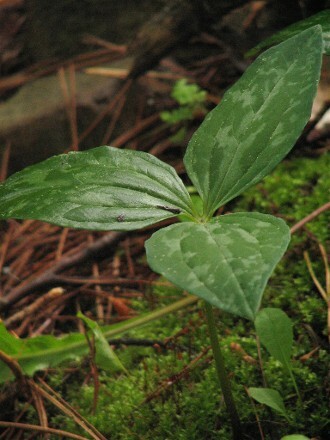 Finally, they halted for a reconnaissance and camped on Emukfaw Creek, on the northern bank of the Tallapoosa, only a short distance from Horseshoe Bend. There, on the morning of January 24, 1814, they were suddenly attacked by the Creeks. The attack came with such fury that Jackson, his army badly crippled, was forced to retreat to Fort Strother. But by March, Jackson was in the saddle again. This time he was determined to exterminate the Red Sticks. Word had been fetched by a scout that the Red Sticks were massed behind fortifications at Horseshoe Bend. Jackson, with an army of 2,000 men, including 500 Cherokee led by Junaluska, set out for the Bend, 70 miles away. The site of the imminent battle, which would make red heroes as well as white and would go down as the greatest Indian battle in history, was a place the Creeks called Tohopki. 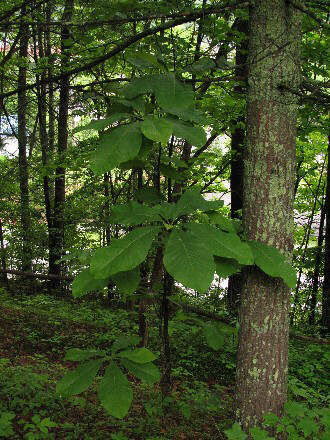 There the Tallapoosa made a bend that enclosed a hundred acres in a narrow peninsula opening to the north. On the lower side was an island in the river. Across the neck of the peninsula the Red Sticks had built a strong breastwork of logs. Behind this breastwork were houses and behind these were dozens of canoes for use if retreat became necessary. The fort was defended by thousands of warriors. There also were 300 women and children. The battle, which became a massacre, opened at midmorning on March 27, 1814. Two cannons opened fire, the balls swooshing through the air to sink into the soft logs of the barricades. Two hours of heavy cannonading were to no avail. The Cherokee had been detailed to cross the river at a ford three miles below the fort and surround the bend so that the Creeks could not escape in that direction. They took position where the Creek fort was separated from them by water. The battle raged throughout the morning. There were dead and wounded on both sides. Among the frontiersmen fighting for Jackson were Sam Houston and Davy Crockett, who would go on to write their names in the history books. A few prisoners were brought in and, while officers were attempting to question them in the presence of Jackson, one broke loose, snatched up a knife and lunged for the general. Junaluska, who had seen the move, stuck out a foot and tripped the Creek warrior, saving Jackson's life. As the battle wore on it became more and more apparent that it was going to be a difficult job to dislodge the Red Sticks, firmly entrenched behind their breastwork of logs. It was then that Junaluska conceived his brilliant plan. Without notifying Jackson, he gathered a dozen Cherokee, sneaked to the river's edge behind the fort, plunged into the water and swam over to where the Creek canoes were moored. 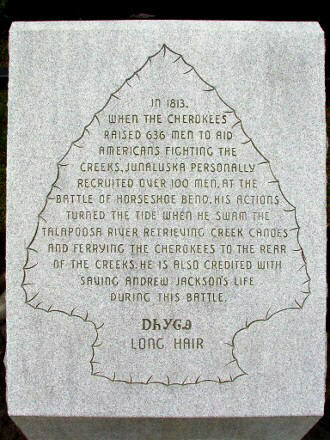 Junaluska and his braves freed the canoes and maneuvered them to the opposite bank where other Cherokee warriors piled into them and, under cover of a steady fire from their own companions, returned to the opposite bank, thus breaching the Red Sticks defenses. This diversion from the rear gave the Tennesseans opportunity to swarm over the breastworks. Now it was hand to hand fighting. Amid the smoke from their blazing homes the Red Sticks fell. When more than half the Creeks lay dead, the rest turned and plunged into the river, only to find the banks on the opposite side lined with blazing guns and escape cut off in every direction. Of the 1,300 Creeks inside the stockade, including women and children, not more than 20 escaped. Of 300 prisoners only 3 were men. The Red Stick defenders of Horseshoe Bend had been exterminated. The result was decisive. Two weeks later Billy Weatherford, the greatest of the Creek chiefs, surrendered to Jackson. Thus an end came to the Creek War and freed Jackson to move on to New Orleans against the British. 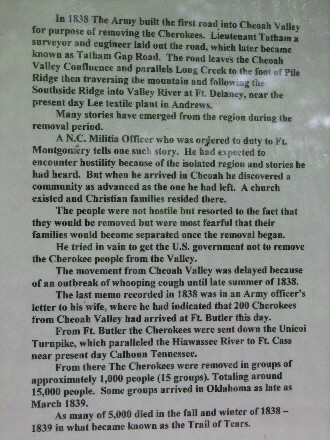 For the first time in a century of war, the Cherokee were allied with the winner. And they saved the day for Andrew Jackson. In a few short years Junaluska would have occasion to recall those words. He would recall them with bitterness. For it was not long until Jackson was in the White House and had set about to remove all the Cherokee to new homes in the West. 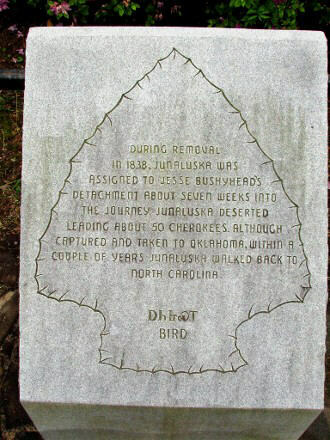 When the great removal of the Cherokee began, Junaluska said: 'If I had known Jackson would drive us from our homes, I would have killed him that day at the Horseshoe.' 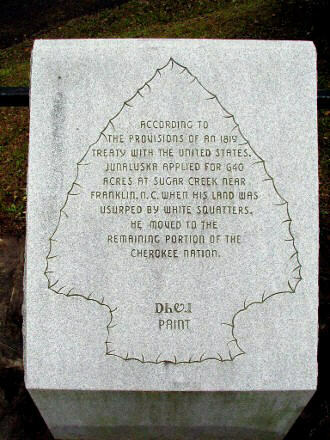 Junaluska was among the Cherokee removed to the West. But he returned to the mountains of his birth in 1842, walking all the way from what is now Oklahoma. And when he returned, the state of North Carolina stepped in and recognized the debt that America owed him. By a special act of the state legislature in 1847, North Carolina conferred upon him the right of citizenship and granted him a tract of land at what is now Robbinsville in Graham County. 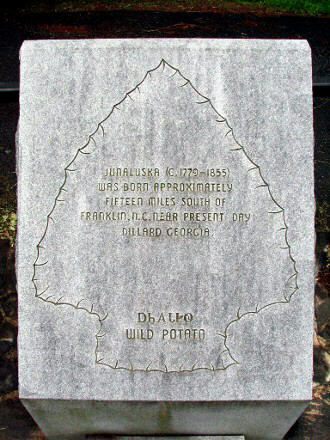 Junaluska died there in 1858 and was buried on a hill above the town where, in 1910, the Daughters of the American Revolution erected a monument to his memory. 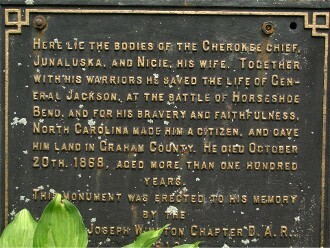 The script on the bronze plaque, bolted to a great hunk of native stone, says in part: 'Here lies the bodies of the Cherokee Chief, Junaluska, and Nicie, his wife. Together with his warriors he saved the life of General Jackson at the Battle of Horseshoe Bend, and for his bravery and faithfulness North Carolina made him a citizen and gave him land in Graham County.'" 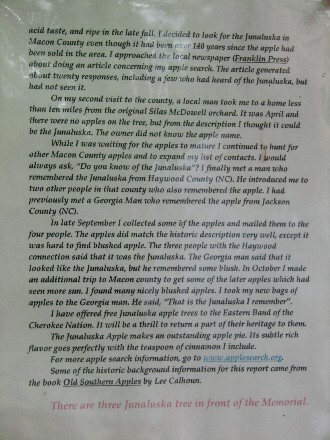 Above, signage from the site tells of the removal of the Cherokee people from this area, and below is an interesting story about the Junaluska apple. Not being a big apple person, I did not know there even was such an apple. A sign I have not included tells us "along the Medicine Trail you will find the resting benches that have been named in honor of deceased members of Snowbird Community." 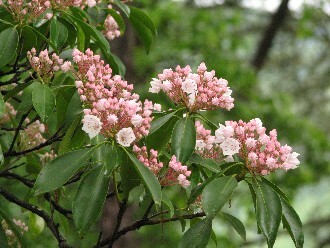 There are also other memorials and tributes to members of the Qualla Boundary and Snowbird Community who played a significant role historically or were instrumental in the creation of some aspect of the Junaluska Memorial and gardens. During the time I was working on this page, I happened to be simultaneously reading "Snowbird Cherokees: People of Persistence" by Sharlotte Neely. 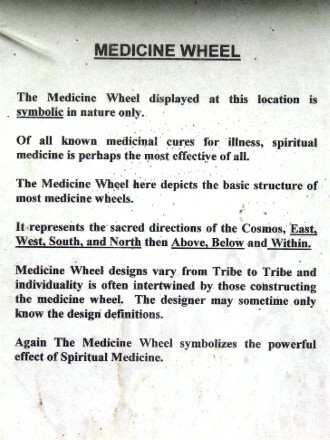 The book clearly emphasizes the strong traditional Cherokee values (Harmony Ethic) and sense of community here.